TALLADEGA, Ala. -- When an engine failure knocked title favorite Martin Truex Jr. from NASCAR's playoffs, the rest of the top contenders got a little bit of breathing room. Then Brad Keselowski suffered the same cruel elimination when his engine failed Sunday at Talladega Superspeedway. There was suddenly a wide-open competition to earn the final transfer spots into the third round of the Chase, and Denny Hamlin and Austin Dillon raced a tense final two laps in overtime to fill the bracket. With each pushing for every last point, it was Hamlin who advanced into the round of eight on a tiebreaker over Dillon. Joey Logano won at Talladega Superspeedway, and Hamlin edged Kurt Busch by .006 seconds for third place and the one point he needed to tie Dillon in the standings. Dillon was ninth, but lost the right to move into the next round based on average finish over the last three races. Hamlin had told his Joe Gibbs Racing team not to give him points updates, and that lack of knowledge forced him to scramble through the final turn as he was undecided on how aggressive he needed to be. "I wasn't sure whether I needed to finish third," he said. "I told them I didn't want points updates. But that's almost when I probably should have got one to figure out what I was going to do. (Dillon) is in the middle of the pack. He's fighting and getting positions. He could change two positions in the last hundred yards. "So you can't really predict it. I knew I just had to try to finish as good as I could." With Truex and Keselowski out of the playoffs before the checkered flag, the suspense came down to final finishing order. 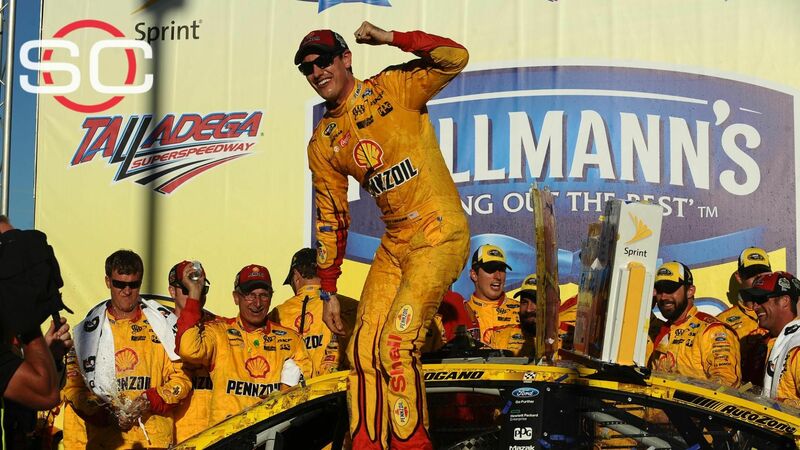 Logano was not in a must-win situation, but the victory sure didn't hurt. Dillon, on a frantic dash over two overtime laps to gain as many spots as possible, called the outcome "heartbreaking." "It sure stinks to lose it on a tiebreaker," Dillon said. Also eliminated Sunday was Chase Elliott. Advancing are: Jimmie Johnson, Kevin Harvick, Matt Kenseth, Kyle Busch, Kurt Busch, Carl Edwards, Logano and Hamlin. There are four Toyotas remaining in the field, all from Joe Gibbs Racing. Stewart-Haas Racing has Kurt Busch and Harvick -- but the two had a heated exchange after the race over alleged contact on the last lap -- while Hendrick Motorsports has Johnson for three Chevrolets in the field. Logano is the only Ford driver. "Feels good to win on a clutch moment like that with the pressure on," Logano said. "I think we ran like a champ." But for mile after mile Sunday, the drivers behaved. Keselowski's engine went with 43 laps remaining after he'd battled climbing temperatures on his car because of debris on his front grille. 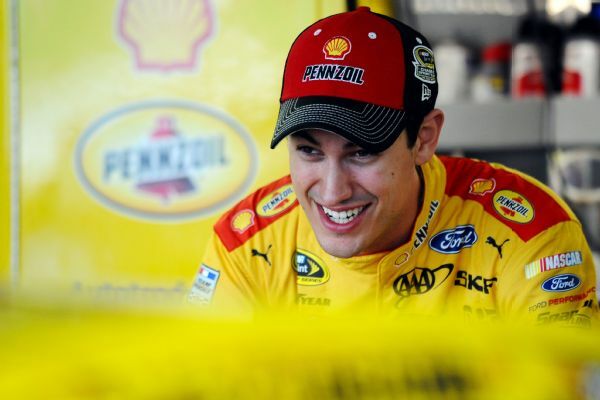 "It is unfortunate for Brad," Logano said. "It happens as a leader picking some (debris up). We picked it up just not as much." Kasey Kahne spun with six laps remaining to bring out the caution for a heart-pounding final restart. The caution had terrible timing for Hamlin, and was a gift for Dillon. Hamlin was trying to hold off Dillon for the last transfer position and the Kahne spin gave Dillon another chance to gain points that would keep him in contention and bump Hamlin from the playoffs. The restart was with three laps remaining. The push was intense for a lap, then a spin by Alex Bowman brought out the caution for an overtime finish. Over the team radio, Dillon was told to concentrate. "Focus forward, man. Focus forward on what we've gotta do. That's what matters, OK?" Dillon was told by a team member. Dillon gained two spots in overtime, but it wasn't enough to pass Hamlin in the standings. TREUX MAKES EARLY EXIT: His engine failure ended his title chances -- one round after he'd moved to the top of the list of favorites. Truex won a pair of races in the opening round of the Chase, and was above the elimination line Sunday and only needed a decent day to advance into the third round. He appeared to be in good shape after winning the pole -- overcoming a qualifying day distraction when his team had trouble in inspection -- but the engine blowing on his Toyota sent him to a last-place finish. OH WHAT A FEELING: Toyota celebrated its 1,000th race at the Cup level by advancing a manufacturer-high four cars into the round of eight. All four Joe Gibbs Racing entries moved into the third round, with Truex's blown engine the only hiccup on the day. Having four drivers, from the same team, still in the playoffs led winning car owner Roger Penske to poke the Toyota camp on the stakes. "They've got more to lose than I do, I guess," Penske said. "They've got four." UP NEXT: The opening race of the third round of the Chase on Sunday at Martinsville Speedway. Logano swept the second round last year and seemed headed to the win at Martinsville until he was intentionally wrecked as payback by Matt Kenseth. The feud between the two ultimately cost Logano a spot in the championship round. The race had to go to overtime, but Joey Logano was able to hold off the pack and get the win at Talladega.